Abernethy Syndrome is characterized by congenital diversion of portal blood away from the liver. There is either an absence of portal vein ((PV), type I congenital extrahepatic portosystemic shunt (CEPS I)) or presence of thin PV radicles (congenital extrahepatic portosystemic shunt (CEPS II)). Blood from spleen and the intestines drain into the inferior vena cava (IVC) through a shunt bypassing the liver, thereby causing an alteration in metabolism of pulmonary vasoactive substances, pulmonary vasodilatation, diffusion-perfusion defects, and eventually arterial hypoxemia. Abernethy malformation is considered as one of the etiologies of hepato-pulmonary syndrome (HPS). We describe a case of Abernethy syndrome (CEPS II) in a child presenting for surgery. A 5-year-old male child with a height of 107 cm and weighing 13 kg presented with cyanosis, clubbing, dyspnea, and restricted growth since 6 months of age. His room air peripheral oxyhemoglobin saturation (SpO 2 ) and arterial oxygen tension (PaO 2 ) were 60% and 39 mmHg, respectively. Blood investigations revealed polycythemia, international normalized ratio (INR) - 5.6, and liver enzymes were normal. Electrocardiogram, chest X-ray, and echocardiogram were normal. An ultrasound of the abdomen revealed a side-to-side communication between PV and IVC, hypoplastic intrahepatic portal venous branches. Doppler ultrasound showed dilated PV, right and left PV arising from the dilated segment and a large communication draining into the IVC with a normal hepatic vein (HV). Computed tomography angiography confirmed CEPS II [Figure 1]. Cardiac catheterization showed the mesenteric vein and splenic vein draining into the PV, which in turn, was draining via a fistula into the IVC [Figure 2], double IVC and diffuse pulmonary arteriovenous malformations (PAVM). There was no intracardiac shunting, pulmonary arterial hypertension or pulmonary venous hypertension. Catheter occlusion of the porto-caval fistula was attempted unsuccessfully and the patient was referred for surgical ligation of the shunt. 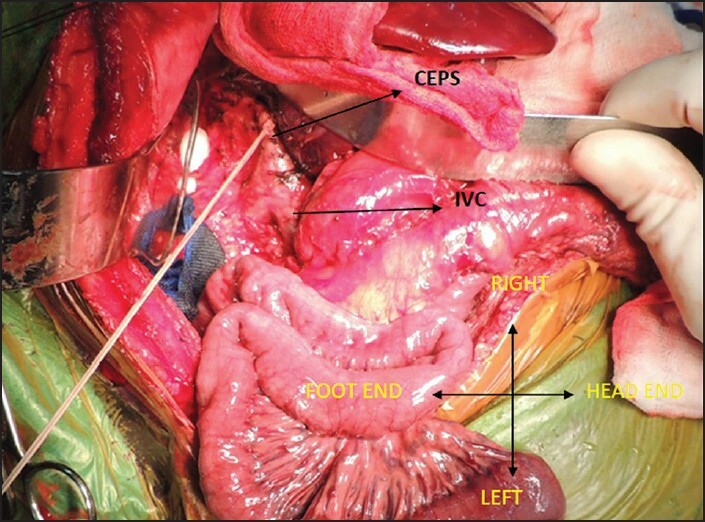 Upper median laparotomy was performed under general anesthesia and a rent was made in the mesocolon through which IVC, PV, and PV to IVC shunt measuring about 2 cm in length and 2.5 cm in diameter was identified [Figure 1]. The shunt was ligated [Figure 2]. Abdomen was closed and patient was shifted to intensive care unit (ICU) on dopamine infusion at 5 μg/kg/min. Controlled ventilation with 100% O 2 did not improve the SpO 2 . The patient was gradually weaned off the ventilator and extubated after 5 hours in ICU. Oxygen was administered by facemask, but SpO 2 and PaO 2 still remained low. His hemodynamics and urine output remained normal throughout the recovery. The liver enzymes increased in first 2 postoperative days (aspartate aminotransferase, alanine aminotransferase and serum bilirubin were 1063 and 949 units, and 3.6 mg/dl, respectively). The patient became very drowsy on these 2 days and his SpO 2 was between 60 and 70%. His INR remained high for next 4 days. Though his serum ammonia was normal, he was prophylactically treated for hepatic encephalopathy. His liver functions became normal gradually and he was discharged on 14 th postop day. On follow-up after 1 month, the patient was clinically acyanotic and his SpO 2 was 90% on room air. A written informed consent was obtained from the parents for submitting the case report for publication. Hepato-pulmonary syndrome is a triad of liver disease, arterial hypoxemia, and pulmonary vascular dilatation. HPS is defined as arterial hypoxemia caused by functional intrapulmonary right to left shunt because of pulmonary vascular dilatation at the capillary and pre-capillary levels in the presence of chronic liver disease. , In the setting of hepatic diseases, liver dysfunction or high portal pressure have been thought to contribute to the pathogenesis of HPS. Three hypothesis accounting for the etiology have been proposed, that is, (i) elevated ET-1 (endothelin-1) circulating in the whole body which up-regulates nitric oxide (NO) production in the lungs by continuously stimulating the NO synthase, (ii) hepatic products necessary for pulmonary vasomotor control are decreased by liver dysfunction or hepatic venous flow reduction, (iii) translocation of gut bacteria activating alveolar macrophages results in increase in inducible NO synthase. So elevated endotoxin because of bacterial translocation and high concentration of ET-1 in the shunt blood play a causal role in development of HPS. CEPS is a rare entity and is classified into two types by Morgan and Superia. In Type 1, portal blood is completely diverted to the vena cava. In Type 2, the PV is intact, but the portal blood is diverted into the vena cava through a side-to-side extra-hepatic communication. , All causes of HPS can be diagnosed by ultrasound, computed tomography, or magnetic resonance imaging (MRI); which will show the shunt and any intrahepatic PV branches. However, in CEPS I, since some patients have small PV radicles which may not be seen on ultrasound but can be detected by shunt angiography and/or liver biopsy. Determining the type of shunt is important in planning the treatment. CEPS I patients need clinical, biochemical, and imaging follow-up; whereas, CEPS II malformation requires early shunt closure to resolve the hypoxemia and prevent hepatic encephalopathy. Shunt closure results in restoration of intrahepatic portal blood flow in most patients. Clinical regression of symptomatology and stabilization of pulmonary, cardiac, neurological, and renal complications is seen in patients post shunt closure. Shunt closure can be done either surgically or percutaneously in the catheterization laboratory. In our case, device closure of the shunt was unsuccessful due to its large size. As we did not have the pressure data, on the operation table, the shunt was temporarily clamped and the IVC and PV pressures were measured (11 and 13 mmHg, respectively). A rise of 2 mmHg in PV pressure was noted after 10 min of clamping. Following shunt ligation, the pressures were measured again and a gradient of 1 mmHg was noted. Our patient continued to have hypoxemia after the shunt ligation despite high oxygen supplementation. The patient remained drowsy on postop day 2 and 3, he recovered from hypoxemia very slowly, required long ICU stay of 8 days, total hospital stay of 14 days, and his SpO 2 was only 78% in room air at the time of discharge from hospital, but it increased to above 90% on 1 st follow-up after 1 month. This long time course to relieve hypoxemia could probably be attributed to the chronic course of disease. These patients should undergo shunt closure as soon as possible before irreversible changes take place in the pulmonary vasculature. Postoperatively these patients should be investigated with daily liver function tests, serum ammonia, coagulation profile, and arterial blood gas analysis till safer limits of SpO 2 are achieved and dyspnea is relieved. Those patients who are severely cyanosed preoperatively may go through a very stormy course in ICU, but eventually improve as seen in our case. Howard ER, Davenport M. Congenital extrahepatic portocaval shunt-the Abernethy malformation. J Pediatr Surg 1997;32:494-7. Alvarez AE, Riberio AF, Hessel G, Baracat J, Ribeiro JD. Abernethy malformation: One of the etiologies of hepatopulmonary syndrome. Pediatr Pulmonol 2002;34:391-4. Krowka MJ. Hepatopulmonary syndrome. Gut 2000;46:1-4. Castro M, Krowka MJ. Hepatopulmonary syndrome. A pulmonary vascular complication of liver disease. Clin Chest Med 1996;17:35-48. Rabiller A, Nunes H, Lebrec D, Tazi KA, Wartski M, Dulmet E, et al. Prevention of gram negative translocation reduces severity of hepatopulmonary syndrome. Am J Respir Crit Care Med 2002;166:514-7. Morgan G, Superia R. Congenital absence of portal vein: Two cases and a proposed classification system for portasystemic vascular anomalies. J Pediatr Surg 1994;29:1239-41. Murray CP, Yoo SJ, Babyn PS. Congenital extrahepatic portosystemic shunts. Pediatr Radiol 2003;33:614-20. Franchi-Abella S, Branchereau S, Lambert V, Fabre M, Steimberg C, Losay J, et al. Complications of congenital portosystemic shunts in children: Therapeutic options and outcomes. J Pediatr Gastroenterol Nutr 2010;51:322-30. 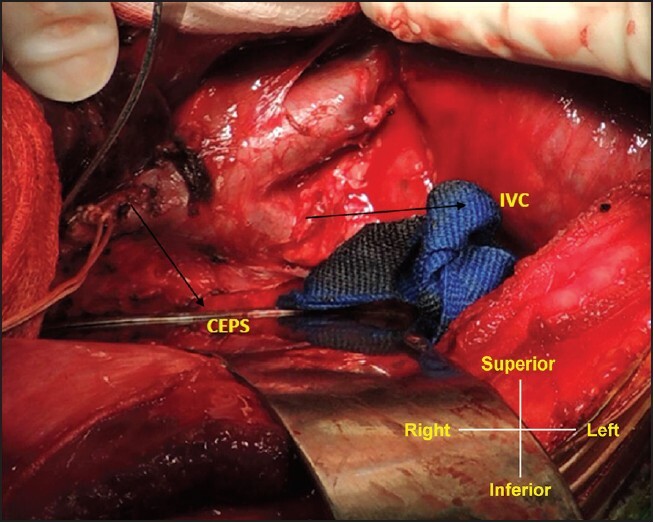 Subramanian V, Kavassery MK, Sivasubramonian S, Sasidharan B. Percutaneous device closure of persistent ductus venosus presenting with hemoptysis. Ann Pediatr Cardiol 2013;6:173-5.